Worsley Works has recently added a Cavan and Leitrim coach to its range of 'Scratch Aid' etched brass body kits in 4mm scale. These coaches were built by Metropolitan in 1887.' there were eight composites and four thirds, though the fret rather confusingly identities the kit as for thirds numbers '8/12'. 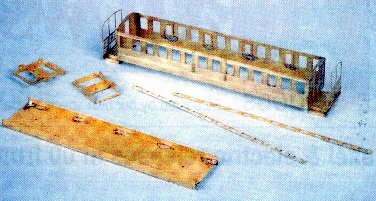 As with previous offerings (originally fully reviewed in the November 1997 RM), the kit consists of sides, ends with verandahs, and floor unit, with separate solebars, buffer beams and end railings, the latter very finely etched. Frames for the correct 4' wheelbase bogies are also included', Worsley can supply the wheels and bearings (at extra cost) it required. The buffer beams and solebars have halt-etched rivet detail which the builder must press out, and the droplights are separate parts which can therefore be modelled in the open position it required. Neatly, they are 'notched' to clear the wire used for the window bars. To simplify production and keep the cost down, the kit does not include the glazing or any interior detail, the couplings, or the fixing nuts and bolts, and there are no 'solid' details as castings. The builder must also supply wire for handrails and door handles, though the fixing holes are present. As usual with Worsley offerings, the roof has to be formed from brass sheet (not supplied), though in this case the clerestory sides are provided. However, there is no guidance on how wide the clerestory should be - some end pieces might have been useful, and we feel that in this instance, with such a complex root construction, components etched to shape and perhaps with halt-etched grooves to locate the clerestory sides would be beneficial. The marginal extra cost of the material involved would have been well worth the accuracy offered and the trouble saved. The root also has to be angled down from the end of the body to the top of the end railings, and one suspects that getting a smooth result is not as straightforward as the instructions suggest! Again, it the root was provided, the V-shaped notch referred to could have been included thereby improving the chance of getting this right. Note too that by 1924 the clerestory sides had all been boarded over. The sides and ends are separate, with no form of location, but they can be accurately soldered together it care is taken, standing them on a true flat surface before the steps are folded. It is worth reinforcing the corners with a fillet of solder; though take care not to impede the fitting of the floor unit. The instructions are basic and simply cover the assembly of the components supplied. assuming - not unreasonably for something that is sold as an aid to scratch building rather than a complete kit - that the builder will be familiar with the techniques required. It also presumes the builder will have access to drawings and photos to complete the detailing as appropriate. Once again Worsley has provided a good basis, which will take a lot of the hardest work out of modelling these attractive vehicles. Worsley Works now has a range of over 50 narrow gauge coach kits in 4mm scale alone, plus other items in 3mm, 5.5mm, and 7mm scales, plus various related accessories. 40p (in stamps) plus an A5 stamped self addressed envelope will bring you a copy of the latest list.